Includes all hardware to attach to existing pedal. Standard strap length is 11.5. Attaches to most metal cage pedals. Fits most shoes up to size 11. Extra Long Replacement straps. Fits Sport Pedal Kits and older style strap sets with preset holes in straps for adjusting. Only available in black. Recommended for shoe sizes 12 and over. Great for winter riding with boots! Utilizes extra long straps and mounts directly to your pedals without the bracket that regular Power Grips require. Pre drilled holes for adjusting tension. Improves cornering clearance and works with most street pedals that that fit toe clips. 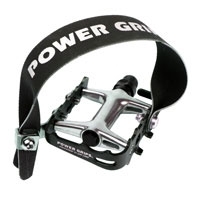 The lightweight HP Pedal kit from Power Grips includes a pair of aluminum alloy pedals with Power Grips pedal straps attached. 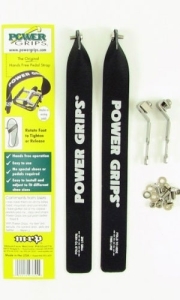 Power Grips replacement straps. Fits Sport Pedal Kits and older style strap sets with preset holes in straps for adjusting. Pre assembled strappedal kit. Resin body pedal with steel cage. Lightweight pedal 500 gramspair including strap.